It's hard not to be inspired by French-girl fashion. With their nonchalant style and enviable wardrobes, they’ve mastered casual-cool. We've already done some digging to break down exactly how to get their summer wardrobes and what they're packing in their suitcases. But one of the most interesting things about stylish French girls might be the timelessness of their outfits. The looks they're wearing today could just as easily have been worn by, say, Jane Birkin or Brigitte Bardot—seriously. Perhaps the best example of this comes down to the jeans they're wearing and the styles you won't see them in. Scroll through Instagram, and you won't see them in anything too trend-driven like lace-up jeans or extreme flares. Instead, they gravitate toward vintage jeans and retro-inspired styles. If you want to tap into their denim style, the rules are simple. First, opt for straight-leg silhouettes. Levi’s 501 jeans are a great baseline—the flattering cut is one you can find in any French girl's closet. Next, consider the wash. Anything from light blue to indigo to black makes the cut, but steer away from anything jarring like an acid wash. Finally, get some styling inspiration from their looks. You can't go wrong with a simple button-down and Chanel cap-toe slingbacks, or a breezy summer blouse with cat-eye sunglasses and espadrilles. Très chic. 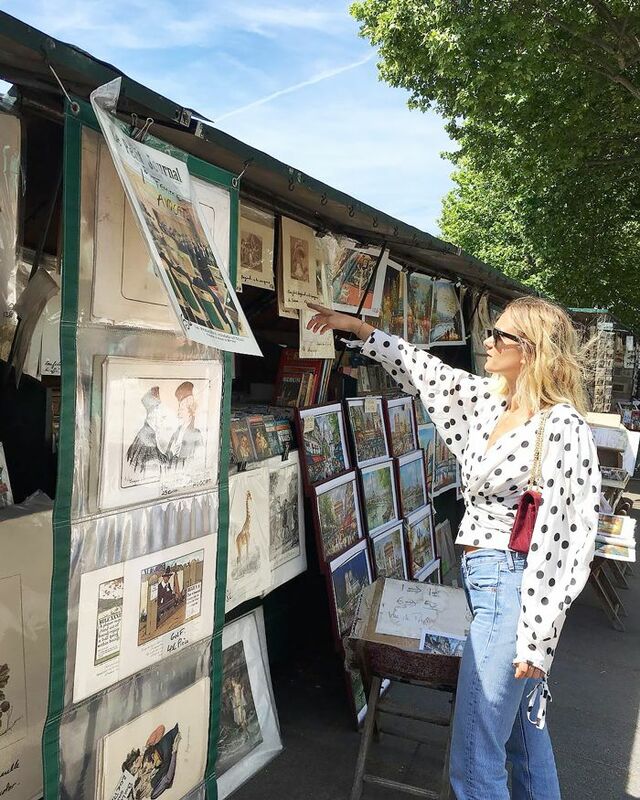 Keep reading to see how French girls are styling their denim, and then shop for our favorite vintage-inspired jeans from Rouje, Re/Done, Reformation, and more. Pair your vintage denim with a statement top and refurbished bag to achieve a retro look. French girls wear their high-waisted jeans with a woven basket bag and espadrilles. Make your vintage jeans the focal point of your outfit. Style them with a staple black tee and timeless loafers. Parisian girls wear a neutral cami with their denim during the day. To transition into night, simply throw on a black blazer and heels. Don't hesitate to pair a navy blouse with your dark-wash denim. Wearing some gold jewelry complements the minimalist look. A pair of Levi's with a white blouse is practically the uniform of French It girls. Make it your own with a statement bag and warm-weather slides. Cropped jeans are a great way to show off a strappy heel. Tuck in a balloon-sleeved white blouse for a retro look. Style this pair with a vintage belt and a tee. Levi's are this summer's must-have piece. Straight-leg jeans look great with sleek pumps or chic flats. This native French line is loved by fashion girls. French girls like Jeanne Damas always wear this line with a summer floral blouse. A light-wash denim is key to pulling off the vintage look. It girls are wearing white sneakers with refurbished denim this summer. A touch of distressed detail adds some personal flair to your denim. Indigo-colored denim is a wash you can easily transition into fall. A double hem is slimming and adds slight detail to your denim. Wear yours with a floral top. This French designer always ensures on-trend Parisian taste. Throw on a black cami with statement heels, and you're ready for a night out. A staple pair of denim is great for running around doing errands. Bloggers are showing off their vintage-inspired denim this summer. Wear a blazer with appropriate shoes and a top for the office. For a more tailored look, avoid denim with distressed detail. Next, read about the eight-piece French-girl summer wardrobe.